The Jordan B. Band brings Christian hope to the homeless and imprisoned by delivering God’s Word through original, Christian contemporary music and speech. Invite us to perform at your shelter, prison, correctional center, TV station or special Christian event. We love promotion! Help us reach our brothers and sisters suffering homelessness and imprisonment. Jordan Colletta is a singer, songwriter, evangelist and program host, located in Atlanta Georgia. He heads JBB Ministries and the Jordan B. 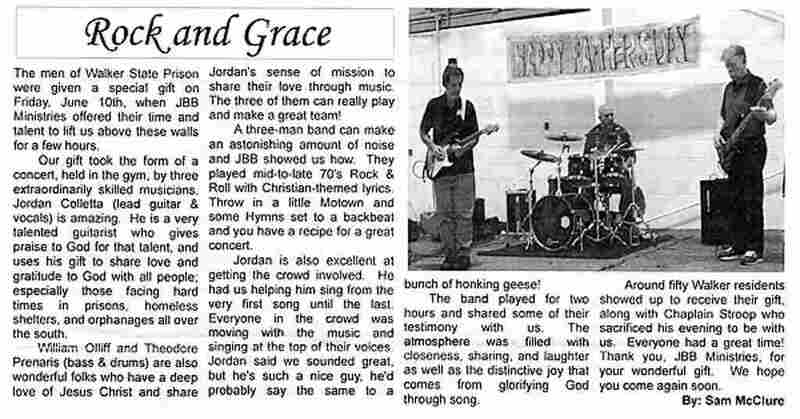 Band, both of which are dedicated to bringing the Word of God to the homeless and imprisoned through original, contemporary Christian music and speech. JBB Ministries is a volunteer organization devoted to delivering the Word of God through original, Christian contemporary music and speech to those enduring hardship. We are volunteers with a passion for music and spreading the Word of the Lord. Initially (2001), we were featured at a Walk Thru the Bible workshop. Later, we began performing at the Central Presbyterian Men’s Homeless Shelter. Over the years, the Jordan B. Band has grown to include over a dozen musicians performing regularly as a trio.